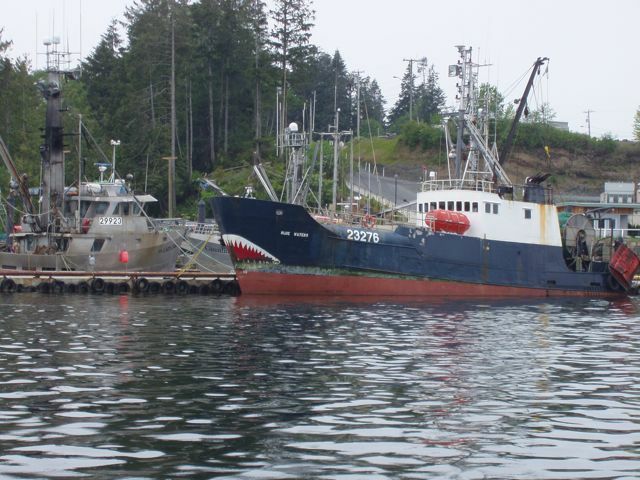 We stayed in Port Hardy for two nights since we had to wait for our hull repair MarineTex to cure, a repair necessary because of damage from exposed bolts in the God's Pocket dock. Luckily, it was a fine place with lots of access to food showers, and Wifi. We met a great guy, John, who is a pilot for Canada Air. He gave us lots of good ideas and discussed world affairs, as well. We took two days to make it to Comox, BC, the key event being the traverse of the Seymour Narrows. For the first time in our sailing lives, we're out of the mountains: another momentous event. Canada is timbering country and Vancouver Island seems to be the epicenter. 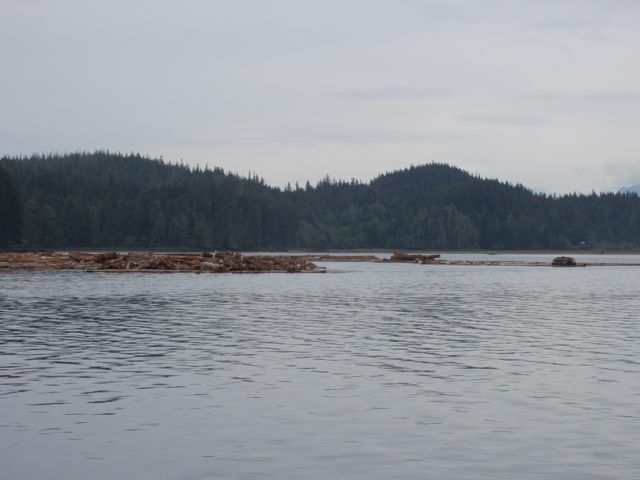 This is a "log farm" outside the Port Hardy harbor. It was here that we heard the seals barking that was mentioned in the blog. No importance other than the obvious sense of humor of the crew. Taken at Port Hardy. [Bill's stuff] This is a huge conveyor that extended several hundred feet from shore. Lots of metal and a good way off the water. It made an excellent radar target. The radar image (fuchsia color) of the conveyor above. It's on the right side of the screen. The targets at one and two o'clock are floating anchoring buoys for large vessels that are using the facility. 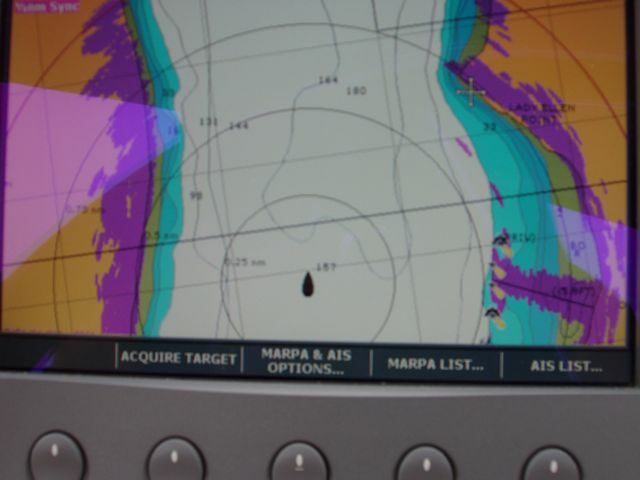 The ability of our radar to overlay its image on our chart is one of the most important features of the entire system. It makes interpretation of the image a lot easier. 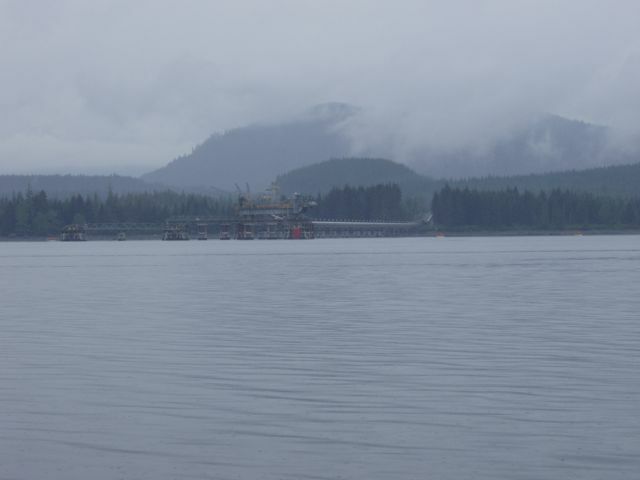 A small tug towing a log tow in Johnstone Strait. There's no wonder that there is a lot of loose trees floating around! Seymour Narrows. 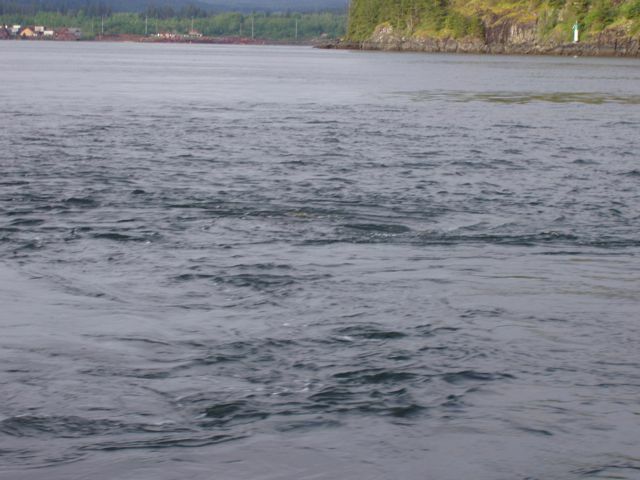 Seymour Narrows is the faucet and drain of the entire Johnstone Strait and a tremendous quantity of water must push through during flood and ebb tides. Tidal currents of up to 17 kts are not uncommon during times of mid-tide. 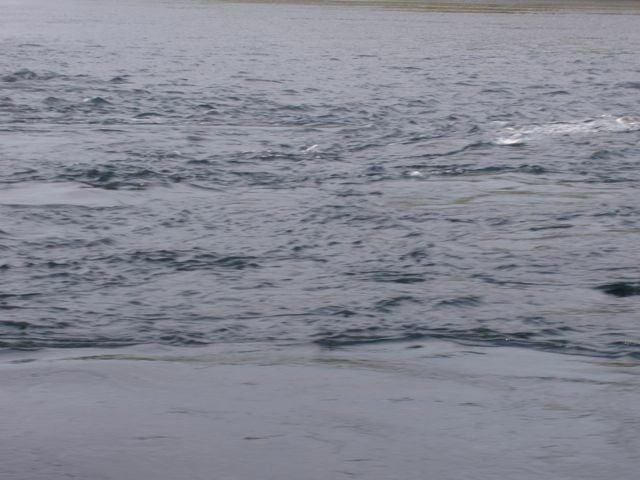 This is an ebb slack water, and these huge whirlpools whipped around our 12.5 ton boat like a plaything. It was very disconcerting. It's hard to convey the violence of the water and the power that it had. We were in despair of having enough engine power to push through even on ebb slack water. 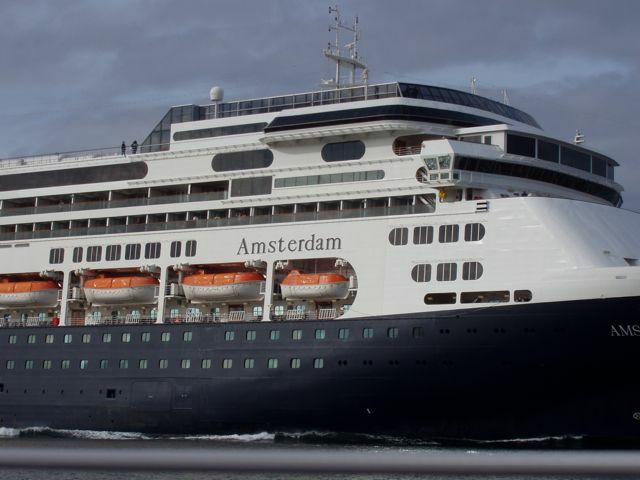 Our AIS informed us that the Amsterdam was going to meet us just after we were through the narrows, and she did. This is an unmagnified image. It's the closest we've ever been to a moving liner. 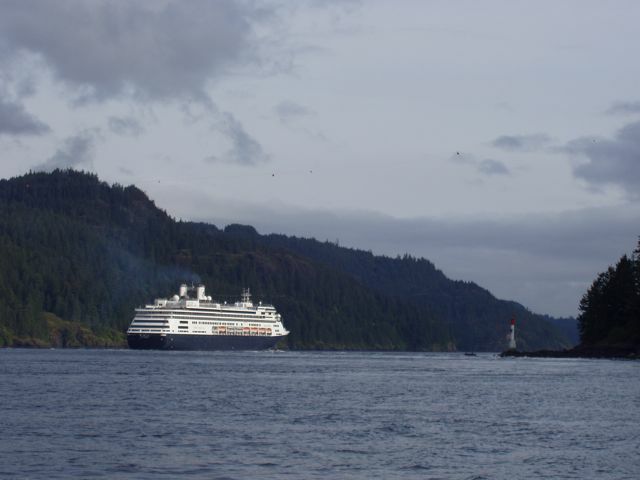 At 16 kts, the Amsterdam motors through the Seymour Narrows. Between the Amsterdam and us, there are the submerged remains of a rock pinnacle that was "removed" in the 1950s in the largest non-nuclear explosion in history. 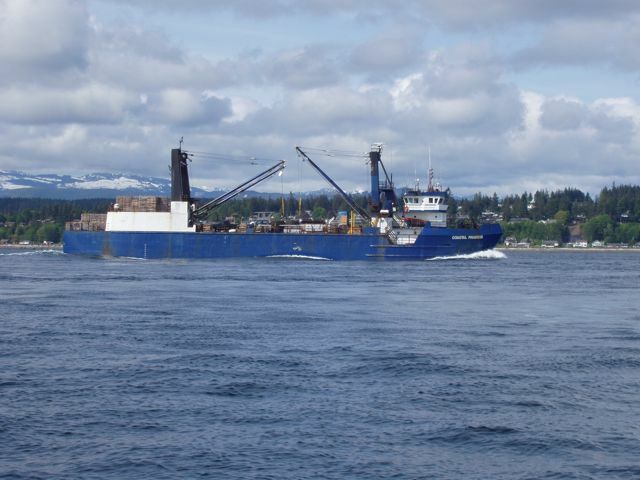 Cargo ship headed to Sand Point, AK, out on the Aleutian chain. The Coastal Provider has a LONG trip ahead. 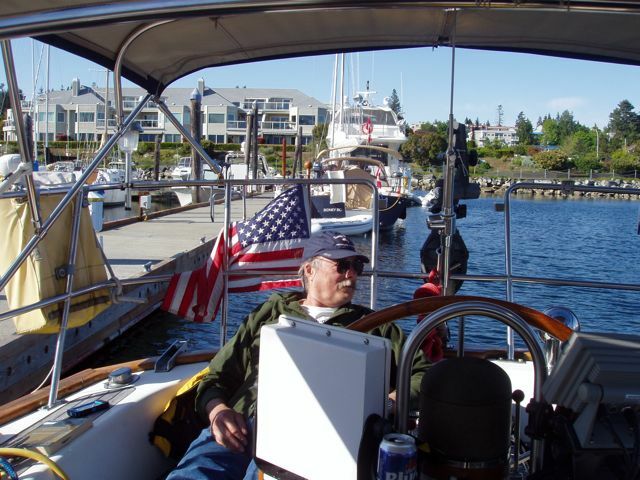 Bill enjoying the sun in Comox. We both liked Comox a lot. Thanks to Donald Smith for pushing us to visit there. 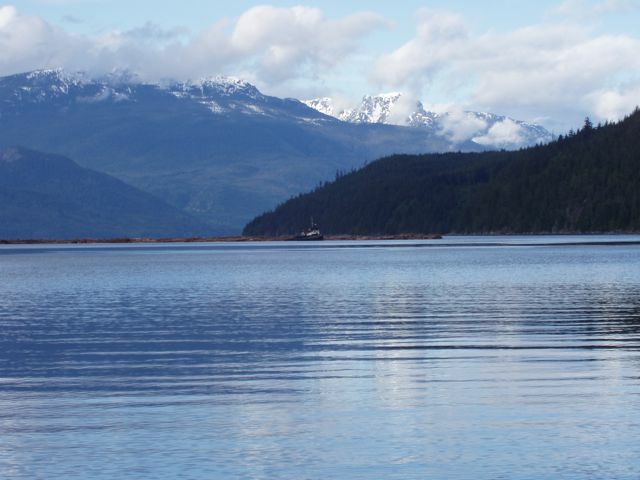 Comox has it going on: 12,000 residents, sunny summers, snowy winters.